A funny Christmas Eve story! Wow! I cannot believe how close to Christmas it is. I am thinking a lot about Christmas Eve. That is my busiest night of the year. It is a serious business to deliver so many presents. Today I was thinking about a funny Christmas Eve story. It was many, many years ago. I almost got bitten on my bum by a dog. NORAD tracking missing sleigh! Santa’s sleigh and reindeer are gone! My sleigh and reindeer keep disappearing from the North Pole. Luckily, NORAD tracking and Sherlock Elf are helping to solve this Christmas Mystery. I’ll keep posting updates here in my blog and on my Twitter and Facebook accounts until we solve this. P.S. 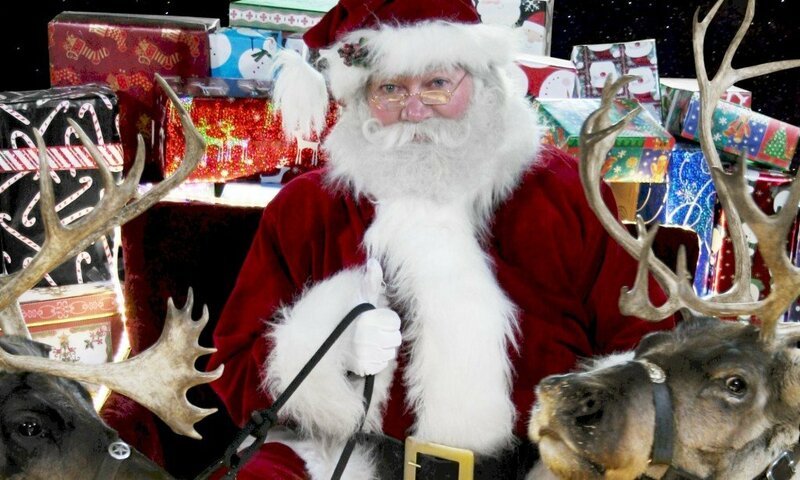 Do you have any ideas what happened to my sleigh? Leave me a message. After that, scroll down to see everyone else’s ideas! You can write Santa a quick message here. But, if you want Santa to reply, then you should send a letter to Santa from this web page. Then Santa will reply to you fast as reindeer fly! Here is what we know so far! Don’t worry. I am still safe at the North Pole. You can track me there on both my Santa webcam and the Santa Snooper. Here’s a photo of me with MrsC from a few minutes ago! NORAD Tracking but Santa still at North Pole! I have sent Sherlock Elf to investigate my missing sleigh and reindeer further! We’ll keep you posted! UPDATED: Sunday December 16th, 2018 8:00 a.m.
Sherlock Elf of the Nawdy N. Nice Elf Detective Agency is investigating. He reminded me of the last time my sleigh went missing. Did u read the stories at #emailSantacom? My reindeer keep bringing the sleigh back to the North Pole but then my sleigh takes off again! #NORADSantaTracker is showing that it is delivering gifts too. What is going on? I hope we can fix it before Christmas Eve! This is quite the #ChristmasMystery. What do you think is happening? UPDATED: Sunday December 16th, 2018 8:00 p.m.
Sherlock Elf noticed that the #SantaTracker says I’m delivering hundreds of gifts too! But I’m not. It’s not Christmas Eve yet. You can see I’m still at the North Pole on my Santa webcam. Sherlock Elf thinks it’s an imposter driving my sleigh. Sherlock Elf also discovered that SOMEONE did something to my sleigh. Instead of helping deliver presents, it’s now sucking up all the presents that people have in their houses! That is what the #SantaTracker is counting: all the STOLEN presents! This is terrible news! NORAD tracking screenshot taken Dec 16th, 2018 at 8:00 p.m. Notice the gifts delivered! Sherlock Elf says to stay tuned! UPDATED: Monday December 17th, 2018 12:00 p.m.
What is worse though, the sleigh seems to be scooping up presents instead of delivering them! Sherlock Elf thinks someone has hacked the system so it looks like the sleigh is delivering presents. But it is doing just the opposite. There may be problems with my sleigh, but don’t worry. I am safe and sound at the North Pole. You can track me here on my Santa Snooper. Someone hacking Santa’s sleigh Gift Delivery computer! Sherlock Elf found the photo above on our North Pole Security Cameras. It certainly looks like someone hacked the computer that controls my sleigh’s gift delivery system. I think that is why my sleigh is scooping up presents. What do you make of it? I’ll keep posting updates on my blog. NORAD Tracking Mystery Update #5 – SOLVED! UPDATED: Friday December 21st, 2018 12:00 p.m.
With your help and help from NORAD, Sherlock Elf solved the mystery! I think it was the photo that gave it away for him. Sherlock Elf found the photo above on our North Pole Security Cameras. What do you think? Did the photo give it away who was causing the mystery? I am happy to report that we have recovered MOST of the presents that were taken. However, I am so sorry if you don’t get everything you wanted for Christmas. Lastly, we should all thank NORAD for their work. And not just for Christmas Eve. They are the people who help keep us safe every day and night of the year. And remember you can track me here on my Santa Snooper (every day of the year!) or at the NORAD or Google sites as well on Christmas Eve. P.S. What do you think of all of this? Leave me a message. After that, scroll down to see what everyone else wrote! The elves made a Christmas Quiz just for you! Checking the elf name generator list! It is getting close to Christmas. Have you done your Christmas Tree decorating yet? I love Christmas Trees. Not to mention I love to decorate them too. But I always use too many lights. Mrs. Claus and I always cut down our own Christmas Tree. Do you cut down yours? Or, do you have an artificial one instead?